Mezco's Burst-A-Box is a pop culture infused twist on one of the most beloved, classic toys, the jack-in-the-box. 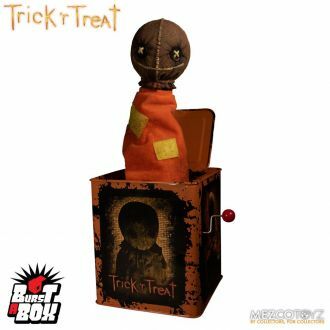 The Trick 'r Treat Burst-A-Box features Sam - part pumpkin, part supernatural being. Sam is the enforcer of the rules of Halloween and shows no mercy to those who disrespect his holiday. This fully functioning jack-in-the-box is approximately 14 tall when popped. The Burst-A-Box features a detailed head sculpt and a clothed spring body, all encased in a tin music box. Burst-A-Box Trick 'r Treat Sam comes packaged popped-out of his tin and perfect for display in a collector-friendly window box.